An opponent just destroyed my tower in Bontago. Bontago is an abstract strategy game where players compete against each other by building towers out of blocks. 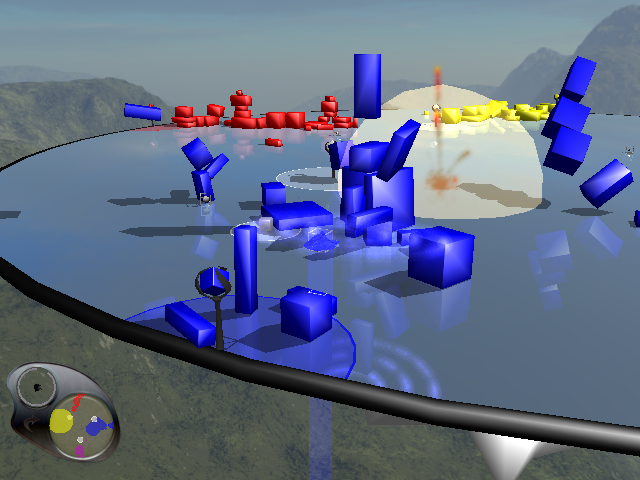 Blocks placed on the field create a circle of "influence", which represents the area that a player controls. Blocks placed higher up have more influence, so bigger towers are better. But watch out: "gifts" will randomly fall on the field, which, if you can encircle them with your influence, allow you to really ruin an opponent's day. These gifts include such things as earthquakes, volcanoes, and rockets. The goal of the game is to capture "flags" in the center by extending your influence all the way out to them from your home. Unfortunately, if you want to play this game online, it may be difficult to find active servers and players since there is no master server in the game. I must admit that this game certainly didn't sound very exciting when I first heard about it. A strategy game about blocks? Meh. But now that I've tried it, I think it has real potential. The game is very polished, and all of the game options are configurable, including the gifts. It includes the option of AI opponents, and the option for team play. It's much more than I expected from a student-made game. As for the gameplay itself, it's quite fun. Who didn't play with blocks as a kid? In this game, you are challenged to build your towers as high as you can. But you also want them to be stable, in case an opponent's gift topples your hard work. It's a game of building things up and knocking them down. It's playing with blocks. There's also a "Sandbox" mode where you can just build things for fun. There is a bit of a learning curve as you get used to the game and its controls, but it's quite easy compared to many other strategy games. Also, there is a Tutorial mode which helps you learn the ropes. And setting up for a LAN game is quite easy. Just use the in-game interface and you'll be good to go in no time. Really my only gripe with the game is with the gifts. Since you have to "throw" them, it can be a bit difficult to get them to go where you want. Also, some of them seem almost as likely to backfire as to actually damage your opponent. However, this does help with game balance; if the gifts were too easy or too good, then games would probably go on forever. My bigger complaint is that if you receive a gift, you must use it. There doesn't seem to be a way to skip it or reject the gift, which you may want to do sometimes. And if you don't use the gift in time, the game cruelly places it in your territory! But this really isn't that big an issue in what is a fun game overall. As a student-made game, and as a free LAN game, so far I think it's great. Note: The game may take a while to load for some people. If you click on the Bontago shortcut and nothing happens, give it a minute (a literal, full 60 seconds) before trying anything.